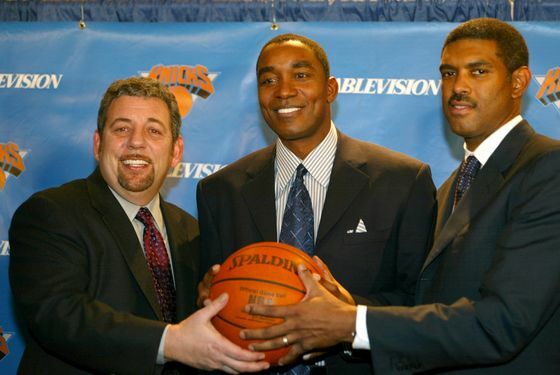 Knicks fans awoke Saturday morning to reports that James Dolan had held a "business meeting" with former Knicks head coach/general manager/alleged sexual harasser Isiah Thomas. Further reports suggested that Dolan — whose attempt to rehire Thomas in 2010 got shot down by the league — is pushing once again to employ the guy. There is near unanimous hatred of Thomas within the fan base, yet folks aren't really freaking out. To begin with, reporters like Marc Berman and Frank Isola — guys who'd jump all over the story if they thought it had life — suggest that just because the two are meeting doesn't mean Thomas is up for one of the big, important Knicks vacancies. He won't replace Scott O'Neil as president of MSG Sports, nor will he replace Kenny Atkinson as assistant coach. He's not even considered a candidate to replace Jay Larranaga as coach of the Erie Bayhawks, New York's D-League affiliate. Rather, word on the street is that Dolan really fancies the idea of paying Thomas to be a "consultant" of some sort, which is where things were headed back in 2010 before David Stern intervened, citing Thomas's position as a NCAA head coach as grounds for rejection. And that's just part of being a Knicks fan these days. One must either accept or ignore that the man with the money and the final say also happens to be ill-informed, infantile, irrational, and all the other nasty words that begin with I. At any given moment, Dolan could override common sense and completely warp the team. It's like living next to a volcano that, by now, has erupted so many times that those who haven't fled the team entirely (the Lin ordeal was the final straw for a lot of people) are so jaded and inured to the terror as to be nonplussed by pretty egregious incompetence. If, tomorrow, the Knicks waive Carmelo Anthony, then immediately hire him as assistant general manager, then try to convince him to sign himself at a markup, nobody will flinch. It'd just be the Knicks being the Knicks. So, to James Dolan I say: Whatever. Do whatever you want. Any Knicks fan who still values his or her own sanity has already bailed at this point. I mean, please don't hire Isiah Thomas. That would be incredibly stupid. I'm just saying that such stupidity no longer impresses us. We've seen it all.